Hope you all have been enjoying your long weekends! We are still out east enjoying July 4th festivities. I wore this look for our family BBQ on Sunday night. Blue & white stripes plus a coordinating striped clutch made the perfect July 4th BBQ look. I love, love, love my denim shorts. (see them styled here, here & here) In fact, when packing for this weekend getaway, I packed my favorite pair of denim shorts (these) & a bunch of different top options. Think everything from this striped blouse and slide sandals to a basic white tee & sneakers to a colorful summer sweater & espadrilles. 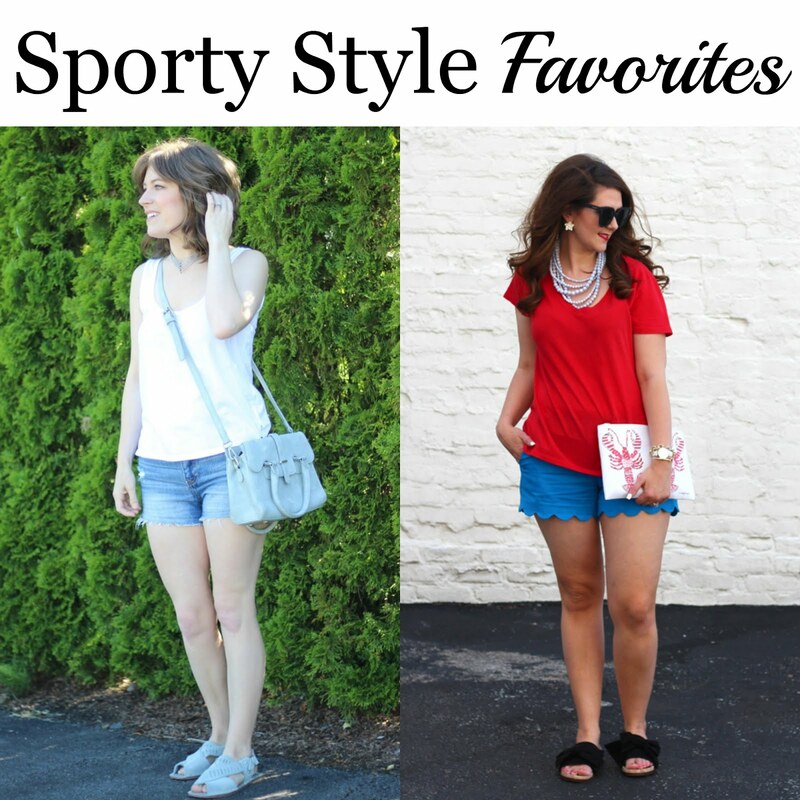 Denim shorts are my ultimate summer staple throughout all of July & August. 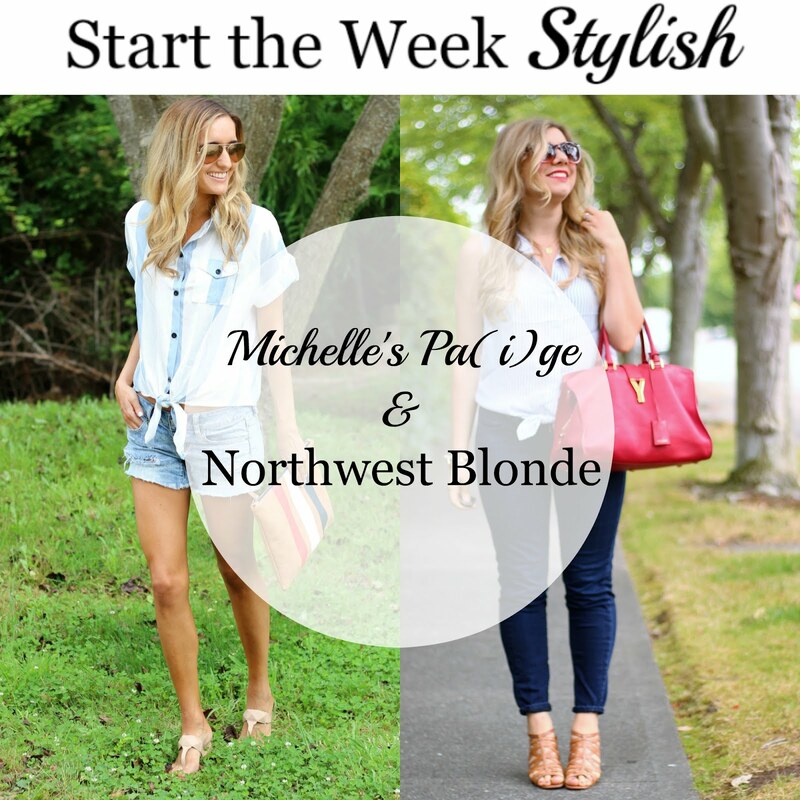 Last week we loved Ruth from My Little Nest & Tif from Bright on a Budget's sporty styles. What an awesome look! I LOVE that shirt! I 100% agree that denim shorts are a must in every girls wardrobe. This top is such a lovely spin on the classic stripes look. Thanks for hosting. I love that this shirt has the ties in the front, Michelle!! I rarely have trouble with items being too short, but on that occasional time, I end up wearing a cami under it!! Good idea! I was on vacation so I was limited with what I had but loved this top too much to let it sit in my suitcase! I love this cute knotted tee- what a great summer piece! What a great shirt, Michelle! Love the tie front! I made a similar post but with a pink striped top! So cute! Great minds think alike! oooh! Can't wait to check it out! Awww thank you so much for the feature! I love your outfit and those shorts are just the right amount of distressed! Enjoy the long weekend! Really cute outfit. Summer perfect! I love your bag and top! Peace! Simply cool and stylish! Cute outfit! This outfit is perfect for a summer BBQ! Hope you have a wonderful 4th! These denim shorts look great on you, and I love them with the stripe top! Happy 4th! I love the touch of knotting the shirt in the front. Also, those denim cutoffs are amazing! This is such a beautiful post - I love the shirt, it's perfect for the warmer days!! !